Having spent another night in Queenstown, we soon headed off for more interesting scenery. Queenstown is 'unashamedly a mining town' say the leaflets. What this means is that there's no attempt to disguise the fact that the surrounding area has been plundered for its copper, tin and probably more. To say this place looks barren is to say that the moon is somewhat lacking in atmosphere - a big understatement. Strangely, though, where you'd normally expect this to be frowned upon, it's almost become Queenstown's selling point. And the funny thing is that I can see how it might have its attraction - a break from all the lush, green wilderness that surrounds it! 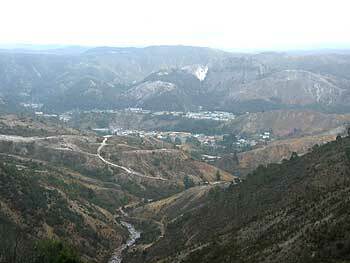 Barren-looking Queenstown - the result of years of mining. Leaving Queenstown, we took the Lyell Highway out to the south, a road that winds dramatically around these barren hills and continues to wind much further out into the wilderness beyond. It was a clear day - blue skies but cool temperatures - and a total pleasure to drive. The Lyell was one of the most stunning routes I have been on, passing through beautiful forest, alongside expansive lakes, past numerous hydro-electic power stations and probably past a whole bunch of must-see attractions that we didn't investigate (actually, I know this to be the case, as we went straight past the turning for Lake St Clair. Ho hum). The drive took us much of the day - with a couple of short stops, we eventually got into Hobart at around 3pm. We had enough time to do our obligatory tourist information centre stop, drive around the city centre a little (by way of orientation, understanding the local area), grab a bite to eat and then find somewhere to stay for the night. Unfortunately, Hobart doesn't have any caravan parks right in the centre, so we had to make do with one that was 10 minutes out on the eastern shores of the Derwent River.